Neossance® Hemisqualane by Aprinnova acts as an emollient. It is C15 hydrocarbon made via fermentation of sugarcane. 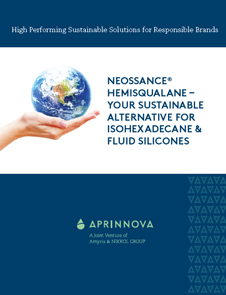 When compared to petroleum-based materials such as isohexadecane or fluid silicones, Neossance® Hemisqualane demonstrates performance equivalence across a wide variety of applications. For example, it has makeup remover abilities comparable to isohexadecane. It also demonstrates performance equivalence (such as combability, color protection, anti-frizz or heat protection) with fluid silicones in haircare applications. With its high spreadability and great sensorial profile, it helps to spread product easily and evenly on the skin, also making it an ingredient of choice for color cosmetics. Aprinnova's process offers the industry a sustainable route to product development. Life cycle analysis demonstrates that its sugarcane based fermentation processes generate significantly less greenhouse gas formation compared to similar products produced from petroleum sources. Neossance® Hemisqualane is ECOCERT-approved, 100% USDA certified Biobased product & NPA certified.